When the Wichita Kansas mother and her husband enrolled their son in the neighborhood charter school, religious instruction was the last thing under their consideration. In fact, had they known the Minneha Elementary School ( a public magnet school) used a curriculum that incorporated the open and direct use of Eastern religious writings, and Islamic core tenets, they may well have chosen a different school altogether. It wasn’t until the boy came home from school in with worksheets in his backpack that the parents were aware that in 1st grade he had been instructed that there were three major world religions: Catholicism, Judaism, and Islam. In 2nd grade, the class was introduced to Eastern religions in a two week segment of the social studies class which, during the week of Hindu, the teacher read daily passages from a Hindu prayer book and followed with a week of reading Buddhist meditations. Remember, we are talking 2nd Grade here, not a high-school Literature or Cultural Studies class! This year the child began 3rd grade. (He and his family are Jewish and he understands that Islamic groups worldwide have declared Jews, among others, as targets of scorn and violence.) 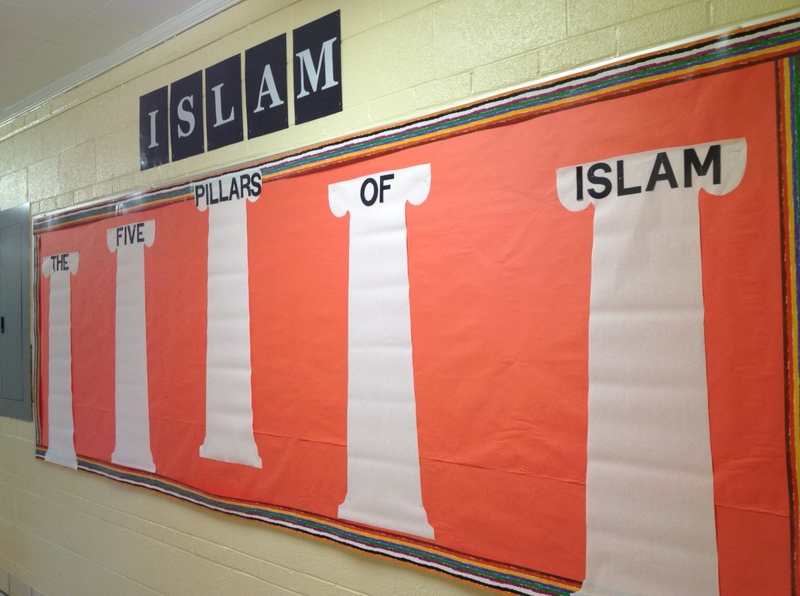 The religious display greeted him and his mother like a slap in the face as “The 5 Pillars of Islam” bulletin board welcomed the elementary students into the new school year, and apparently, the next level of social and cultural engineering (which has plagued public education for a while now), Islamic instruction. It’s happening all over the United States. School textbooks, particularly those published by Pearson Education, Inc. under the name Pearson Prentice Hall, are rife with Islamic friendly references. One such History textbook, used by a Florida school district for three years now, contains a 36 page chapter dedicated to Islam, while no chapters at all were dedicated to Judaism, or Christianity, both of which are arguably the bedrock of Western civilization. According to the Florida Rep. Rich Workman, the “Muslim Civilizations” chapter was confirmed to him by the publisher, to be written by an Islamic Cleric. One reference to the Muslim takeover of Medina says the people there received Muhammad with gladness and “happily accepted Islam as their way of life”. No mention of the thousands of Jews and non-believers that were dispossessed, exiled and slaughtered in the process. That statement is a half -truth, and therefore a lie. While some earlier passages in Koran do make friendly to Jews, they are never considered “fellow believers” (which insinuates equality), and those passages are abrogated by the latter, and even final word in Sura’s 5 and 9 on the matter which state that Christians are “Unbelievers” and polytheists, because they believe in the Trinity (Father, Son, Holy Spirit), (Sura 5:73) and that Muslims are to have no part of polytheism or those who practice it, furthermore are to fight against them, and the only Christians or Jews who were allowed to exist were those who submitted (definition of Islam) to Muslim rule and agreed to acquiesce to Islamic Law (Sharia), which posited them as much less than equal “fellow believers”. Similarly, Sura 5:56-57 warns Muslims not to seek the friendship of “People of the Book” (Jews), also called “infidels” here, who rejected Muhammad’s religion, saying that Allah “has cursed” them. These are the conditions by which Christians and Jews are permitted to retain their “religion”, living as “dhimmi” under Islamic governance. The major objections with this situation are threefold. Salat – The 5 daily prayers, each with a name and time for performance following ceremonial washing. Ramadan – The Fast during the month of Ramadan celebrating the initial verses of Koran given to Muhammad, and a time of introspection, and celebratory meals. Hajj – The pilgrimage required by every Muslim if able, at least once in their lifetime. Many ceremonial religious exercises performed in Mecca. Keep in mind this is not a display about the height of Islamic culture during the Fatimid Dynasty, or the great libraries kept at Cordoba by the most liberal Caliph in Islamic history, Al Hakam II. Secondly, as already touched on briefly, these are elementary aged students, not junior high or even high schoolers, who are more equipped to have an objective approach to such sensitive subject matter. As a point of balance, we are informed, there is a picture of “The Last Supper” on an adjacent wall to this display. Whether the “Last Supper” or Michelangelo’s statue of David, a classic piece of artwork, unless used in a larger theological discussion, is not necessarily of a religious inference, and even if a student did inquire about the individuals in the picture, a satisfactory explanation can be historical and even cultural in nature without even broaching a theological point. Does the school intend to post the 10 Commandments, depict Baptism and the Eucharist, and compare the 3 core values of Judaism: Torah (Learning), Avodah (service), and Gilmut Chasidim, (human interaction)? If the school gives equal time to these then there is equity. Anything less is prejudice. The 5 Pillars are theological religious instruction and must come down. The School has taken the display down “until the unit is taught later this fall”.